A long-time Gujarat government client propagating Gujarat as India’s best business destination around the world, Ernst & Young (EY), one of the best known international consultants, has said that Ahmedabad tops the list of “second tier cities for investment”. The data published by it show that 26 per cent of the around 505 business executives it has inteviewed identified as India’s best investment destination among all "emerging business destinations." The report, titled “EY’s attractiveness survey India 2015: Ready, set, grow”, further says that “35 per cent of businesses established in India rate Ahmedabad as India’s leading emerging city, followed by Vadodara (15 per cent)”, though when it comes to non-established investors, who do not have presence India, “preferred Jaipur”. As a result, the report says, has emerged as "a favorite among first-time investors, particularly in telecoms and IT-enabled services”, but this it believes is more because of its proximity of Delhi, the national capital. The 250 km corridor off Delhi is fast turning into the hotspot foreign investors, it adds. Singling out three other towns which are becoming prominent for investment destinations, the report mentions Halol, Sanand and Vapi as “increasingly becoming industrial hubs” along with Chakan, Jaipur, Mohali, Thrissur and Varanasi. The survey for the report was carried out in March-April 2015, just ahead of the General Motors deciding to withdraw its car plant from Halol and shift to Maharashtra. As for Vapi, it has the stigma of the most polluting township of India, declared by the Central Pollution Control Board. The report does not take into account environmental issues while rating cities. However, the report believes that the shift away from the big metropolises is the future of India, pointing out towards the Government of India’s decision, in September 2014, the unveiled plans to build 100 Smart Cities by 2022, which is expected to boost demand in the real estate, construction and TMT sectors, boost demand for digital technologies -- initiative to lead to more than INR20b (US$330m) of extra investment in the technology sector." 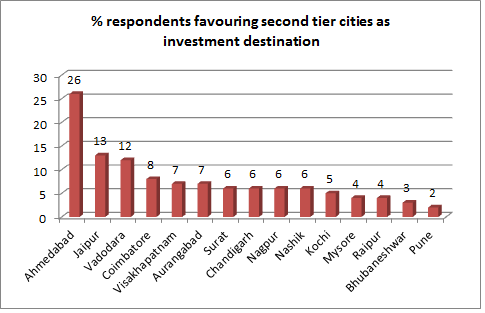 One can understand Ahmadabad being at the top; but it is unthinkable that Pune to be at the bottom of the pack, cities like Nasik, Aurangabad, Kochi etc being a more preferred investment location!There is something wrong in the criteria for evaluation.